Company Picnic: Battalion Commander and Bn XO’s kids. I drove kids around all afternoon that day. This one is in Germany. The first field exercise I participated in was a REFORGER exercise: Return of Forces to Germany. We loaded up our s**t and deployed from Louisiana to Germany. First Sergeant Robert Judd, a soulless man, is trimming my hair. I was the company commander’s driver and the company clerk. I was a clueless kid. Hadn’t turned 20 yet. This one would be on Fort Polk, after I got my rank back from being busted for a hot urinalysis. Symbols of a misspent youth. 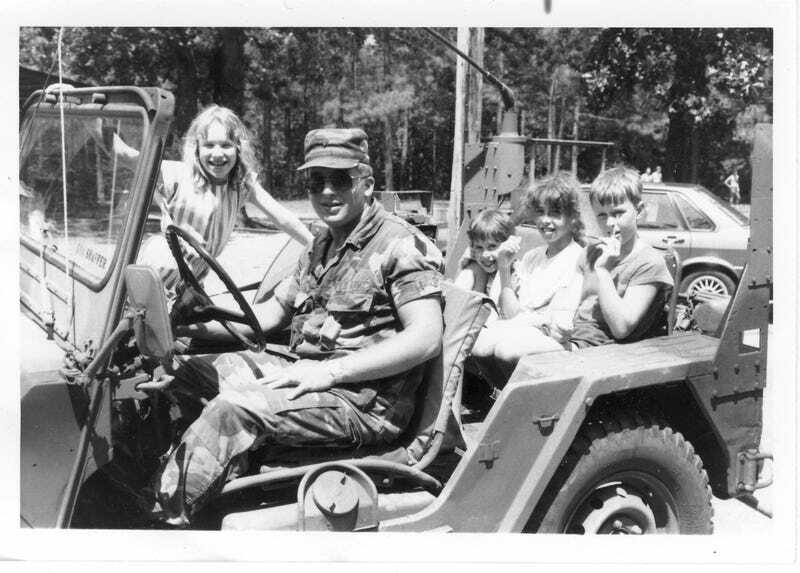 I was active duty Army from 1984 to 1990. Got out as a sergeant, E-5. Duty was rough in those days: you really had to scrape a lot of icing off the cake to be able to enjoy it.